Nage en eau vive ,hydrospeed dans les gorges de Saint Georges à Axat. Immediate start over the Saint Georges Gorges, in the middle of a typical forest of the high valley of the Aude river. Let embark with your hydrospeed, (kind of foam sledge) directly in Class III rapids. 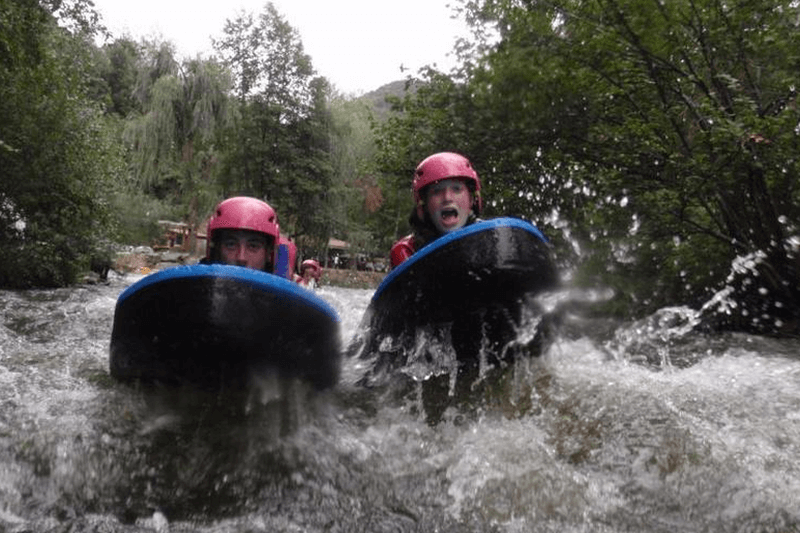 Followed by small Class II rapids after the gorges, then cross the village of Axat by the basin of the French Championships of canoe-kayak which allows a slalom initiation and arrival directly at the Camping du Pont d'Alies. The Rendez vous is done on our base for the fitting and taking of the material specific to the activity. Our minibus will take you over the gorges. The journey allows you to discover the route from the road. Our guides give you the recommendations of use to the practice of hydrospeed and accompany you throughout the descent until arrival at our base. For more comfort our changing rooms are equipped with hot showers to rinse you after the activity. Duration: 3h00 total, 2h15 on the river.